Grab some friends and explore the streets and bushland of Darwin's Northern Suburbs area. Enter the 4-hour event on bikes (pedal version) or the 6-hour event on foot. 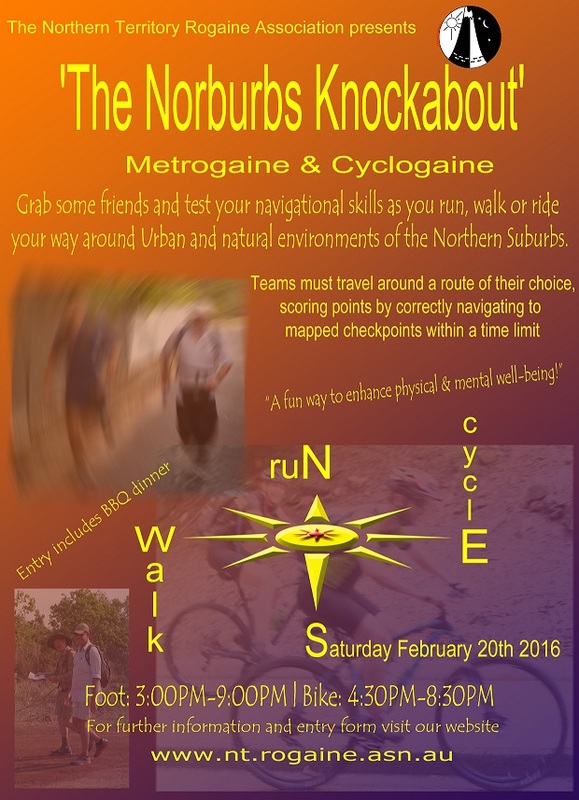 Metrogaines and Cyclogaines are sporting events based around the urban environment in line with the guiding principle of Rogaining. Rogaining is a sport of cross-country navigation, involving both route planning and navigation between checkpoints using a map. Teams of 2-5 people choose which checkpoints to visit within a time limit with the intent of maximizing their score. The route you take and the time you spend on the course is up to you, as long as they are within the respective time limits. Call it a fun run, walk or ride with a twist as you and your team navigates through the course as determined by your pre-planned route at a pace you set using the map provided. It suits anyone from fun social teams to the ultra-competitive. The competitive can choose to go hard, while others may simply want to enjoy a leisurely afternoon walk or ride. Entry also includes a BBQ dinner. Entries now open, final entries close 17th February.